While SimsUshare is easy enough to pick up and use for basic simulations without additional help, it has a lot of depth for more intricate behaviors that we want you to be able to use as your needs dictate. This page has many video tutorials on all aspects of SimsUshare, but you can always contact us through the chat facilities of the site, by emailing us, or by phone (215-627-8146) for personalized assistance. SimsUshare Academy is our educational portal to help you learn how to advance your SimsUshare sim development skills quickly and consistently. The Academy features free courses for three levels of Simulation Developer skills that you can use to help your Department’s personnel all create and edit simulations to the highest level at which they feel comfortable. Check out the Academy and get started by creating a free login. SimsUshare Platinum (and Platinum Network) are the development and playback tools for simulations. This page has short video tutorials to help you get started as well as take your sim development skills to the next level. You can find more video tutorials on our YouTube channel as well as the SimsUshare Academy. If you have a CTC subscription, you can use the SimCloud/CTC to transfer (upload/download) sims and share them across devices. See the CTC/SimCloud Help section below. However, the following videos show how to copy sims manually from device to device, as well as record a video of a sim in Windows. Network allows one to make multiple simulation folders accessible within the app, as opposed to a single folder of simulations. The following videos show you how to use the special features of SimsUshare Network. The SimsUshare Command Training Center (CTC) gives you the ability to share simulations among colleagues and devices through the cloud (“SimCloud”), and conduct multi-company exercises from sims you upload. The exercises are run over the Internet, so your participants (and instructor!) can be virtually anywhere geographically. AlphaACT® FIRE is a web-based training solution that helps fireground incident commanders improve their decision-making skills in the high stress, chaotic environment of a fire response. The program uses simulations from a library of pre-built sims, or ones you build as videos with any tool you like. AlphaTRAC is a partner of SimsUshare. The following tutorials show how to load your own SimsUshare sims into the AlphaACT platform. The Platinum Enterprise license can ‘float’ among devices running different platforms, so long as only one device has been activated at a time (per license). For example, suppose you purchase SimsUshare for Android from Google Play. If you purchase a Platinum Enterprise license from us, you can apply that license to your Android device to get enhanced features, or apply it to another computer or device (Windows, Mac, or iOS), so long as you logout/deactivate the Enterprise license from the Android device. If you have multiple users who want to create/edit simulations on a Windows network, you should consider the Network version, which allows any user on each licensed computer or device (10 minimum) to create and share simulations. How do I cancel my subscription if I have auto-pay on? If you selected auto-pay when you originally signed up for your subscription, you must call us at +1.215.627.8146 or email us at billing@simsushare.com to cancel your subscription. Why can’t I use my pictures on iOS 12 in SimsUshare? High Efficiency—Encode photos/videos you take using the efficient H.265 codec. Most Compatible—Always use JPG for images and H.264 for videos. How can I make more than 3 sims on SimsUshare Platinum Mobile? SimsUshare Mobile (iOS & Android) comes with the ability to create or edit up to 3 sims but play any number of sims. If you have made 3 already and want to create more, you will need to delete one or more of the first three. To create/edit more than 3 simulations, you need to purchase a Platinum Enterprise license subscription. The Enterprise license allows you to create or edit any number of simulations on your mobile device, as well as use that license on any other platform, so long as only one device is activated at a time. If you login/activate your Enterprise license on SimsUshare Mobile, then create more sims, then logout/deactivate the license, SimsUshare keeps all the sims you have made so you can still play them–you may only edit the top three sims when the Enterprise license is not active on the device. Soon, the Enterprise license will allow you to use certain cloud features. The following instructions tell you how to copy/transfer sims for each platform, iOS, Android, and Windows/Mac. Scroll down to the “File Sharing” area. You will see an entry for “SimsUShare” (on the left), and a folder named “SimsUShare” on the right (if you have not run SimsUShare Mobile yet, there won’t be a folder there. Run the application at least once before copying any sims onto the device, so that the folder gets created). Your computer will save the whole folder in the location you chose. Open the newly-saved folder (from the steps above) on your computer, then open the “sims” folder. You will see a list of all the sims you had made on your device, for example “RANCH1″. The folder names will be very similar to the sim names, unless you have renamed the sims inside of SimsUShare Mobile. Paste the source folder(s) into the target folder. The next time you start SimsUShare on your Windows or Mac computer, it will ask you whether or not you want to add the new sims to your catalog. If you choose not to add them, it will continue to ask you each time you restart the application. If you are already running the program, you can navigate to the main (home) screen and select the menu and menu item “Scan for New Sims” to cause it to process any sims adds since starting the program. Windows: right-click and select “Send To > Compressed (zip) file” from the pop-up menu, and it will create the zip file. Macintosh: Control-click and choose “Compress” from the pop-up menu, and it will create the zip file. In iTunes, from the screen above, choose “Add…” and select the zip file. Important: click the “Sync” button in iTunes to ensure the files are added immediately. On your device, if SimsUShare Mobile is running, go to the main (home) screen and select the menu and item “Scan for New Sims”, then it will prompt you to add the new sims it found. If SimsUShare Mobile is not running, start the app and it automatically will scan for new sims, then ask you if you want to add them. If you add the sims, SimsUShare Mobile will erase the zip file. Simulations are stored within a special folder called SimsUShare in your Documents directory on your device or computer. Use any File Manager app to take a look there, after installing and running the app at least once). On all platforms, each sim you make is contained in a new folder within SimsUShare/sims, with an alphanumeric name automatically assigned based on the sim name you chose. For example, a sim you entitled “Ranch House 1″ will likely have the folder name RANCHHOUSE1, unless that was already in use at the time you made the simulation, then it will have a slightly different name. Needless to say, folder names have to be case-insensitively unique (i.e., no “Ranch1″ and “RANCH1″). That sim folder (RANCHHOUSE1) completely contains the assets in your sim, so you simply copy the folder to/from your device and computer. Behind the scenes, when the app starts, it scans your sims folder to organize the sims it finds (you can also choose the menu item “Scan for New Sims”, from menu on the main screen). If it discovers a new sim, it will come up with a prompt asking you if you want to integrate the new sim(s) it found. You can choose to integrate them, or ignore them (it will keep asking you each time the app starts). If you have deleted a sim folder manually from your device or computer without telling SimsUShare Mobile, it will adjust its record of the sims. The simplest way to copy/transfer sims among different machines is to use the “Change Base Sim Folder” option off the menu on the main screen to point to a shared folder from which you can edit or play simulations. Other people or computers you use SimsUshare on can also point this location, and thereby you can share your sims. Caution: By default, anyone who points to a shared location can copy, modify, or even delete that sim, but you can setup your network permissions to let others only copy or play your sims. Typically, you will want to keep your own sims in a private folder and create additional folders in which you copy sims that you want to share. If you simply want to copy sims among computers, you should open your Documents folder and navigate into the “SimsUShare” sub-folder, then go into the “sims” folder beneath that. You will see a set of folders within, one for each of your simulations. Copy the sims you want, and on your other computer, place them in the same place (DocumentsSimsUSharesims). Run SimsUshare on your other computer, and it will detect the new sims and ask you to confirm that you want to add them. Are there any example sims I can get to use or adapt? Check out our “Example Sims” page to see the latest set of free sims we have for downloading. If you have sims you would like to contribute, please let us know! What’s the best and easiest way to learn how to use SimsUshare? We have designed SimsUshare to be as simple as possible for creating basic to moderately-complex simulations. We offer some suggestions about getting started with SimsUshare here, as well as video tutorials and written documentation, but how you use SimsUshare in the classroom or field…that is up to you. Nonetheless, we have many excellent training partners who can help you learn to apply SimsUshare in your department, whether through on-site, hands-on workshops or online tutorials. For example, check out Modern Fire Instructor’s Fire Sims Made Easy, for a comprehensive, video-based class on building and applying sims in the classroom. 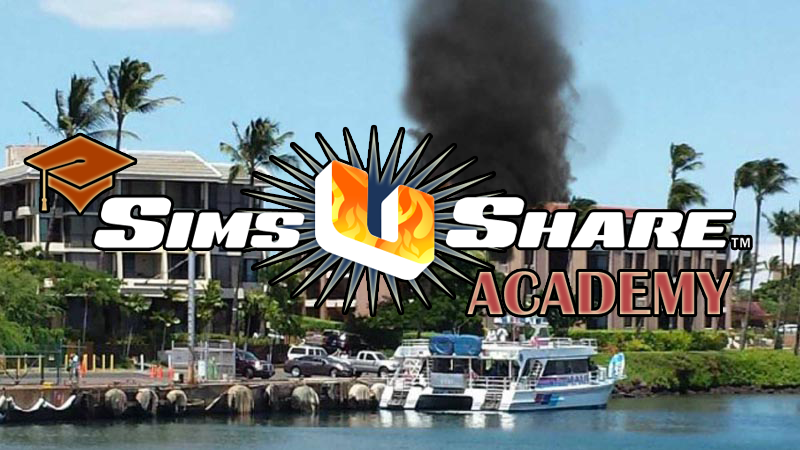 If you are interested in hosting a class in your area on building and using simulations, or you are a fire or safety instructor interested in teaching a class with SimsUshare, please contact us to make arrangements. 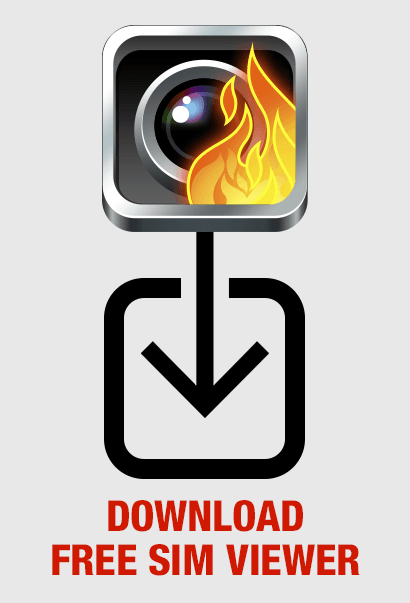 Only SimsUshare for iOS (iPhone/iPad) currently has a built-in video record feature. On iOS, you can also use the Reflector app to record your screen, as well as mirror the screen on a computer. If you run the app on Windows or Mac, there are several tools you can use to record the screen during playback, and then you can make a video of your sims. For example, check out aTube Catcher, Snagit, and Camtasia Studio. On a Mac, you can use the built-in QuickTime screen recorder. Another simple but effective way is to use your cell phone or other camera and simply record the screen. I have SimsUshare for iPad/iPhone/iPod Touch. How can I show the app on a projector? If you have an iPad 2 or higher, or iPhone 4S or higher, you can get a VGA adapter to connect your device to a projector. If you want to beam your screen to a PC or Mac wirelessly (and record the screen), and you have an iPad 2 or higher, or iPhone 4S or higher, you can get the Reflector app, which we highly recommend. How can I show the app on a projector from an Android device? The easiest way is to plug your phone into HDMI output and out to a projector. If your projector does not have an HDMI input, there are kits to convert HDMI to VGA. If you have no HDMI output on your phone or tablet you can use the Chromecast device to mirror your screen. If I purchase the app for my iPad or Android tablet, do I need a separate license for my iPhone or Android phone? You do NOT need to purchase separate licenses between your own iPhone/iPad. Similarly, you do NOT need to purchase separate licenses between your Android devices registered on Google Play. This does not mean if you buy it for iOS, you get it for Android, too, rather, the license extends across all devices for that platform according to Apple’s and Google’s policies for your own personal devices. However, if your department has purchased multiple mobile devices, according to Apple’s and Google’s policies, you need to acquire the app for each device, despite the fact your IT department may use the same Apple ID or Google ID for all devices. Can I make effects come into the scene after some time, rather than immediately, to make an evolving scene? The app gives you the ability to introduce elements after a set period of time. Most plugins (effects) have a property called “Fade-In When” and “Fade-In Duration”. Fade-In When says when to start fading in the effect. Fade-In Duration says how many seconds to fade the effect in before it reaches its set opacity. We set the maximum time settable with the slider to be 30 seconds. If you need a longer time, you can time the number of seconds in the box provided at the right end of the slider. Please remember that the time is relative to when you start the sim, not when the location (or effect) starts. Therefore, if you set a fade-in for an effect on Side C for 30 seconds, but you start on Side A first, the effect will come in 30 seconds after the sim starts, regardless of whether you are viewing Side C.
You want to check out our Network version (click here for documentation). The regular SimsUshare Platinum is licensed on a per user basis. The Network version allows any Windows user on each licensed computer to create or edit simulations. The Network version also has special features to allow sharing of multiple folders, for example, private folders for each user’s simulations, and shared folders to distribute simulations across your Department. As well, the Network version can be installed in a shared folder, to make access, configuration, and updates very easy. The Network version does not yet allow you to coordinate multiple running instances of SimsUshare. However, you may have any number of instances of SimsUshare running on licensed computers even if the Network version is installed in a shared folder. How can I install the (free) Network Version and allow users to see the same simulations? If you have the individual Platinum SimsUshare to create and edit sims, you may want to enable functionality that permits your whole department to play or use those sims using our free sim viewer. The advantage of installing the free Network sim viewer is that you only have to update the software in one place (a shared folder) when SimsUshare has updates. Either create a new folder on a shared drive, or select the FOLDER on the shared drive that contains the file “catalog.xml” and folder “sims”. Important: Select the parent folder of the sims folder, which is the folder that contains the config.xml file and the sims folder, NOT the “sims” folder which is where your sims are actually stored. If you do not have a folder of sims yet, run SimsUshare so that it will create an example sim folder with the introductory sims for you. This will be in your Documents folder, under “SimsUShare”. We suggest you copy and rename this folder onto your network folder, under a name such as “My Sims”, or “Department Sims”, or something other than SimsUshare, since that can be confusing to your users who are looking for the SimsUshare application. This file contains comments that can tell you about various options you can set here. Replace the my_shared_folder with the path (for example, \network-shareetc) to your simulation folder. This will be the simulation folder from Step #1 that you have put on your network share. On computers that you want to access SimsUshare, setup a shortcut on the Desktop to the application in the shared network folder. This is for our Network edition customers who want to allow users on licensed computers to create or edit sims as well as play them. The idea is that each user will create/edit sims in his or her own private area, but be able to place or retrieve sims in common (shared) folders. To activate the license for that computer, go to the main screen and on the menu (top right), there is a menu item “Upgrade to Platinum”. Follow the steps to enter the Purchase Code (license). Once activated for the first user on that computer, all other users on that computer will get access, without having to enter the license code. Replace sim_title with the name you want the folder to appear as, and replace my_shared_folder with the path to the shared folder. Add more lines if you want to have multiple sim folders. Save and close the file, then open SimsUshare. When you go to Edit or Play, you should see “My Simulations” (which is the default private area for that user’s sims) and a bar with the folder title you specified (in step #6). To copy sims from one folder to another, select the sim you want to copy, then go into the menu on the Edit screen and choose “Clone”. It will then prompt you to select which folder you want to clone the sim into, and it will ask you to confirm the name. In this way, you can copy sims to and from the common sim folder(s) you create. You can use Method #1 for the Platinum subscriptions you have to edit/create sims into the common folder. Is there an older version of SimsUshare available? Yes you can buy the 2012 version of SimsUshare™. SimsUshare Platinum can play and edit simulations made with SimsUshare 2012. Will SimsUshare run on Linux or Chromebooks? We only offer SimsUshare for Windows or Macs, but we do have a customer who told us he was running it on an Intel-based (as opposed to ARM, which we don’t think is possible) Chromebook through Wine (https://www.winehq.org/). There is also a variant of Wine called Crossover (https://www.codeweavers.com/products/crossover-linux/).